Mosaic supplements its print issues with lesson plans that are developed based on the content of each issue. 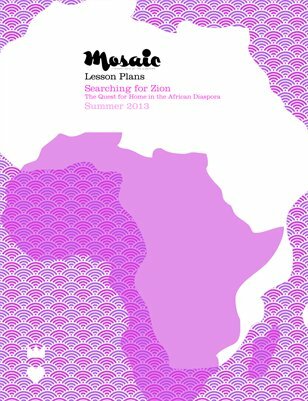 These lesson plans, developed for secondary school educators, demonstrate how Mosaic’s content can serve as a connective tool to empower educators to use books, writing, and reading to engage students. In 'Searching for Zion: The Quest for Home in the African Diaspora,' Emily Raboteau’s second book, the author journeys from New York to Israel, Jamaica, Ethiopia, Ghana, and the American South on a quest for the Black Promised Land. A memoir that penetrates Raboteau’s deep need for a homeland to call her own, this narrative expresses the African American longing for a place to belong. The forced displacement of Africans and the subsequent erasure of an authentic African identity has generated the beautiful, expressive culture of Diasporic peoples in the west. Yet, an insistent urge to locate a place of origination persists in the communal heart of slave descendants, and this narrative is its pulse.